The "Class Level Information" table lists the number of levels of the Cow, Iron, and Infection effects (Output 44.6.1). The "Radial Smoother Knots for RSmooth(t2)" table displays the knots computed from the vertices of the t2 k-d tree (Output 44.6.2). Notice that knots are spaced unequally and that the extreme time points are among the knot locations. The "Number of Observations" table shows that one observation was not used in the analysis. The 12th observation for cow 4 has a missing value. The "Dimensions" table shows that the model contains only two covariance parameters, the G-side variance of the spline coefficients ( ) and the R-side scale parameter ( , Output 44.6.3). For each subject (cow), there are nine columns in the matrix, one per knot location. 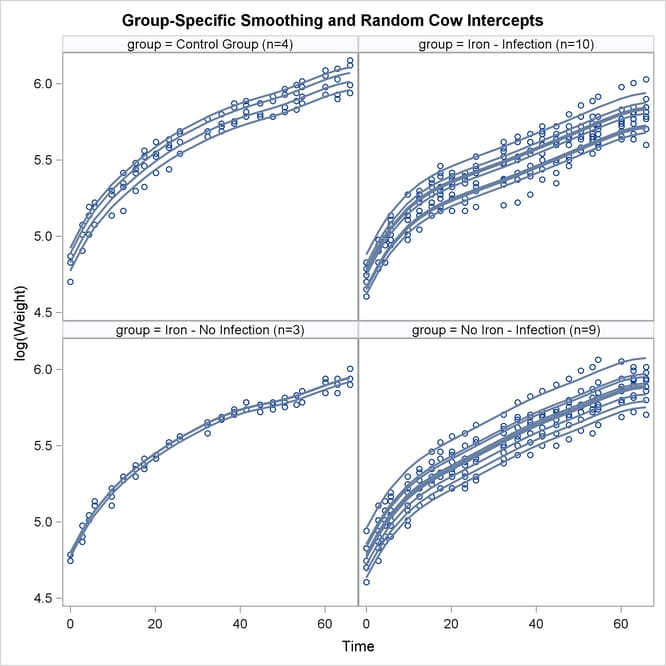 The GLIMMIX procedure processes these data by subjects (cows). The "Optimization Information" table displays information about the optimization process. Because fixed effects and the residual scale parameter can be profiled from the optimization, the iterative algorithm involves only a single covariance parameter, the variance of the spline coefficients (Output 44.6.4). After 11 iterations, the optimization process terminates (Output 44.6.5). In this case, the absolute gradient convergence criterion was met. The generalized chi-square statistic in the "Fit Statistics" table is small for this model (Output 44.6.6). There is very little residual variation. The radial smoother is associated with 433.55 residual degrees of freedom, computed as 597 minus the trace of the smoother matrix. The "Covariance Parameter Estimates" table in Output 44.6.7 displays the estimates of the covariance parameters. The variance of the random spline coefficients is estimated as , and the scale parameter (=residual variance) estimate is = 0.0008. The "Type III Tests of Fixed Effects" table displays F tests for the fixed effects in the MODEL statement (Output 44.6.8). There is a strong infection effect as well as the absence of an interaction between infection with M. paratuberculosis and iron dosing. It is important to note, however, that the interpretation of these tests rests on the assumption that the random effects in the mixed model have zero mean; in this case, the radial smoother coefficients. 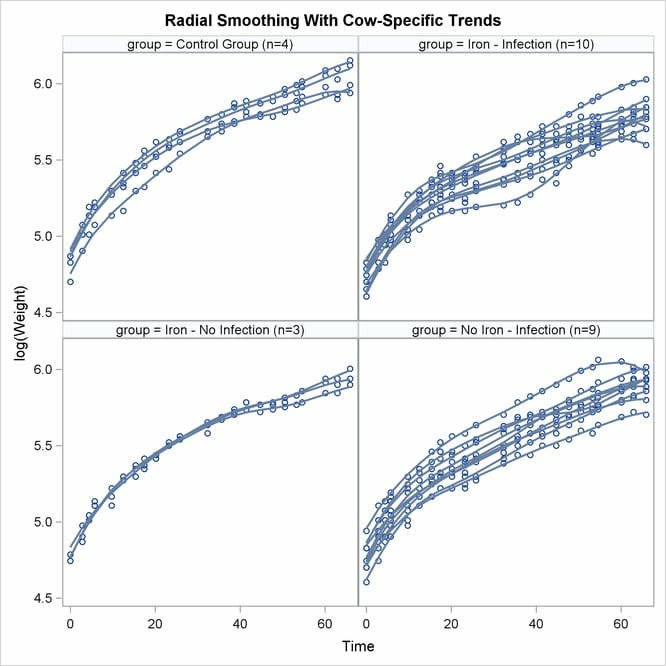 The trends are quite smooth, and you can see how the radial smoother adapts to the cow-specific profile. This is the reason for the small scale parameter estimate, . Comparing the panels at the top to the panels at the bottom of Output 44.6.9 reveals the effect of Infection. A comparison of the panels on the left to those on the right indicates the weak Iron effect. In Output 44.6.10, the "Optimization Information" table shows that there are now four covariance parameters in the optimization, one spline coefficient variance for each group. Varying this variance component by groups has changed the –2 Res Log Likelihood from –1886.29 to –1887.95 (Output 44.6.10). The difference, 1.66, can be viewed (asymptotically) as the realization of a chi-square random variable with three degrees of freedom. The difference is not significant (p = 0.64586). The "Covariance Parameter Estimates" table confirms that the estimates of the spline coefficient variance are quite similar in the four groups, ranging from 0.4788 to 0.7105. Results from this analysis are shown in Output 44.6.11. The "Covariance Parameter Estimates" table in Output 44.6.11 displays the solutions for the covariance parameters. The estimate of the variance of the spline coefficients is not that different from the estimate obtained in the first model (0.5961). The residual variance, however, has more than doubled. Using similar SAS statements as previously, you can produce a plot of the observed and predicted profiles (Output 44.6.12). The parallel shifts of the nonparametric smooths are clearly visible in Output 44.6.12. In the groups receiving only iron or only an infection, the parallel lines assumption holds quite well. In the control group and the group receiving iron and the infection, the parallel shift assumption does not hold as well. Two of the profiles in the iron-only group are nearly indistinguishable.